There have been many films about space travel lately. Some have been big budget films like The Martian (2015), Interstellar (2014) or Gravity (2013), other smaller indie fare like Love (2011) or Moon (2009). Most of these films take very different approaches to the exploration of loneliness set in outer space. 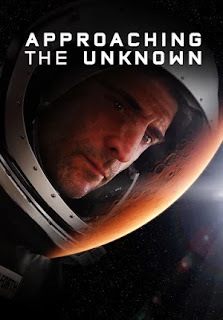 Approaching the Unknown follows suit in such a way that it resembles a mixture of the Angels and Airwaves’ produced Love (2011) and Ridley Scott’s adaptation of The Martian (2015). Yet rather than stranding a man on a space station or on Mars with only science and determination to battle the loneliness, this film concentrates on the difficulty of getting there in the first place. It doesn’t take long to get Captain Stanaforth (Mark Strong) into space so we can watch him try to acclimate, but brief flashbacks show what made the mission possible in the first place. After forcing himself out into the desert alone with no water, he tested a reactor he designed to create drinkable water from dirt and rocks. His success provides enough hope for both he and NASA to take on the mission, but they also know it’s a one way mission. That doesn’t seem to be an issue for Stanaforth considering his lack to familial ties to Earth. He’s painted as the workaholic type who has devoted his life to his work. Sacrificing himself to be on Mars to help lay the groundwork for the first human settlement is the highest achievement possible. Yet as his lengthy trip wears on, he endures loneliness and equipment malfunctions both of which threaten to break his resolve. This film comes as interest in space exploration has peaked yet again. As talks of one way missions to establish human colonies on Mars continue to hit mainstream media, we can expect to see even more films on the subject. However, it’s unlikely a real mission to Mars would be a solo one, and likely for the reasons shown in this film. Perhaps the one thing that sets this film apart from other recent examples of the genre is Stanaforth’s desire to be alone and to give himself up for the sake of future generations of space explorers. Where Matt Damon played a man unwillingly stranded but nearly unshakably positive in his can-do attitude, Mark Strong plays a character very nearly the opposite. Stanaforth is clearly smart, but space regularly refuses to cooperate with even your best laid plans. Rather than remain positive, he slowly descends into a lonely depression that makes him reconsider everything. The film alternates between giving us exposition in standard voice over form, and more natural scenes in which he explains the science of things to curious students. Later he’s able to watch videos these students send him talking about their own fascination with going to Mars. They serve as incentive to keep going, and continually remind him why he does what he does. Yet his receptiveness to these videos wanes with each passing day. Yet that leads me to one of the film’s faults. It rarely bothers to keep track of the days. Once in a great while a number pops up to state how many days of this 270 day journey have passed, but they’re few and far between and have such large leaps between them that it’s difficult to tell how much time is passing between scenes. Having a sense of the timeline might have helped make more sense of his degrading mental state. Otherwise first time writer/director Mark Elijah Rosenberg makes a competently crafted film, with a strong lead performance (no pun intended), and about as much science -whether real or not- as The Martian. Yet his script features enough minor flaws and other contrivances that the sum of its parts never quite rises above. This film spends a lot of time inside a spacecraft, but does very little to spice up these lengthy scenes visually. It also doesn’t have much opportunity for the stunning vistas found in The Martian and Interstellar. It does, however, make time for some spectacular shots of outer space’s picturesque areas of colorful gases and seas of stars. The minor nitpicky scripting quirks involve sentences that all seem to begin or end with one character stating another character’s name. They repeat each other's names as if they've just met and the repetition helps them remember. Or more likely, the repetition is meant to remind the viewers in case we forget. Never, in the course of normal human conversation, have I used a person’s name so much. There’s also an ominous meetup with a space station where he receives his first bit of depressingly negative vibes from the surprisingly unprofessional pair of astronauts who greet him. They serve the obvious purpose of making our once stoic astronaut begin to wonder whether or not he’s made the right decision. I’ve made a lot of comparisons to The Martian, but another obvious inspiration here, particularly in it's trippy, dreamlike later sequences, is 2001: A Space Odyssey. Yet this film remains a far more narrow vision. It lacks the thought provoking existential questions that make other examples of the genre much better films. It wants to be a character study, but doesn’t give the character much to study. There are some decent ideas here, but they’re not paid off in a satisfying way. We’ve seen many of these elements before, but done much better elsewhere.